Artists: Agnieszka Brzeżańska & Ewa Ciepielewska, Carolina Caycedo, Paweł Freisler, Olivier Guesselé-Garai, Tamás Kaszás, Paulo Nazareth, Guarani-Kaiowa & Luciana de Oliveira, Issa Samb, Xu Tan, Hervé Yamguen. Can a shell sing to me? Can a human being be a snake? Can a tree be my mother or father? Can I converse with a river? Can a chicken help to communicate with my ancestors? Are there human beings that know how to sing like birds? Can my apple tree call for my help? Can animals in the forest show me how to survive? Can I listen to the insects in a fallow in the middle of the city? Collaborative and trans-disciplinary artist Antje Majewski (born 1968 in Marl, Germany) has opened an ongoing dialogue with colleagues from Brazil, Cameroon, China, Colombia, France, Hungary, Poland, and Senegal, and invited them to contribute works exploring the reciprocal relationships between human and beyond-human beings in a poetic way. The exhibition at Hamburger Bahnhof – Museum für Gegenwart – Berlin stems from this conversation between the participating artists and their interactions with others. The project and its title emerged from a conversation between Senegalese painter, sculptor, performance artist, playwright and poet Issa Samb and Antje Majewski under the trees in his courtyard in Dakar. Sadly, both Issa Samb and the trees are gone today, but the discussion set a process, a laboratory in motion. It was the start of meetings, travels, and conversations between Majewski and the invited artists. 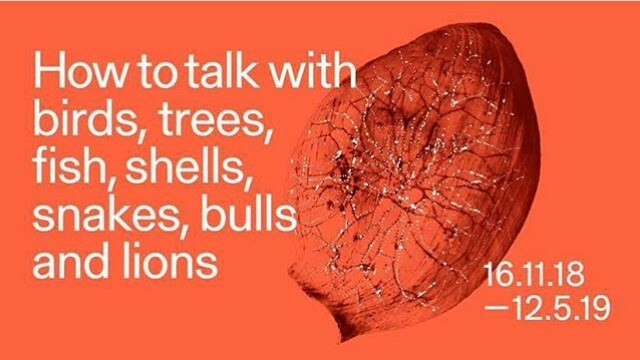 How to talk with birds, trees, fish, shells, snakes, bulls and lions takes artists’ interactions with endangered places, societies and environments as points of departure. The presented works often focus on specific places that have been destroyed, altered, or are seriously imperiled by encroaching capitalism, colonialism, and other detrimental human influences. Videos, large-scale installations, sculptures, manifestos, poems, photographs, drawings, and paintings address delicate socio-ecological systems, of which human beings are always a part. The artists speak from personal positions of dissidence to today’s dominant modes of interaction with the environment—whether feminist, decolonizing, situational, and by proposing radically non-capitalist ways of interacting with humans, other living beings, and matter. The emphasis on “speaking” or “talking” raises questions as to how meaning is created and conveyed, and for whom. The concept of “meaning” in Western science seems especially human, since most semiotic modes of communication presuppose a human mindset. And yet language is just one mode of expression in the planetary semiosis, and like other meaningful acts, it is rooted in the environment and all those dependent on it. Talking with birds, trees, fish, shells, snakes, bulls and lions requires keen attention to different voices, and openness to the sound of languages that we might not understand. Enacting this communication means suspending the grammar and style regime, and listening to murmurs and reverberations, repetitions and pauses. We need to learn how to listen and respond to other beings with empathy, attentiveness, and love.